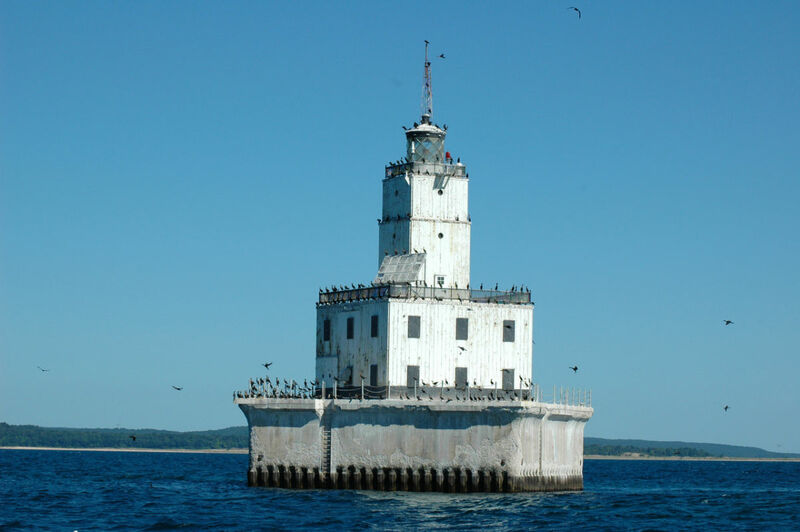 Located in Lake Michigan between North Manitou Island and the Leelanau Peninsula, this unusual lighthouse was established in 1935 to mark a dangerous shoal, and is still in operation today as an automated navigational light. The lighthouse is not currently open for tours, but it can be viewed up close from the ferry that takes visitors from Leland to the Manitou Islands or from the top of Pyramid Point in Leelanau County. The North Manitou Light Keepers purchased the light in 2016 from the Coast Guard after being abandoned for almost 40 years. A restoration effort has begun and the light is being restored to her former glory. Please visit our website to become part of the restoration and rehabilitation efforts.